Japan is a very odd society, but no members of that society are as strange as the otaku. Think of a video game nerd mixed with someone with agoraphobia and absolutely no social skills, and you’re getting close to people like SAL9000. He has a real name, but prefers to go by SAL9000 because he married a video game character and he fears people won’t understand the love he has for his digital bride. 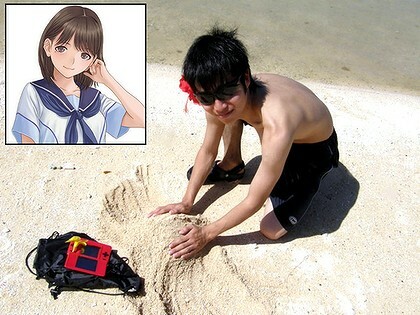 The lucky woman is Nene Anegasaki, a character from the dating simulator game Love Plus. Not only did he marry his video love, he also took her on a honeymoon to Fiji, as you can see above. They also travel around Tokyo, seeing the sights and being general tourists. (She must not be from Tokyo.) SAL9000 even promises to be faithful to his wife and this particular version of Love Plus. The game might upgrade, but his old lady’s going to stay the same.